Tighter envelopes are trapping polluted air inside homes. Fortunately, there are several sure-fire ways to guarantee both efficiency and high-quality indoor air. ALTHOUGH IT MAY seem counterintuitive, indoor air is typically two to five times more polluted than outdoor air, according to the United States Environmental Protection Agency (EPA). With people spending 90 percent of their time indoors, indoor air quality ranks in the top five environmental risks to human health. 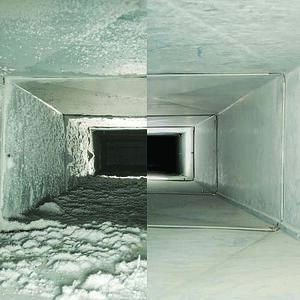 Cleaning ducts is one of the easiest ways to improve IAQ in older buildings. But with better filtration and whole-house vacuums installed in the first place, the need for regular cleaning might be greatly mitigated. As energy-efficient homes have tighter building envelopes with less air infiltration, indoor air quality deteriorates without proper ventilation and mindfulness. This is especially true in winter months, when less outdoor air typically enters the home, and the concentrations of contaminants can increase. There is a lot that builders can do to identify potential sources of pollutants and mitigate them. The primary two strategies include avoiding the use of polluting materials and activities, and mitigating the concentration of pollutants with ventilation. 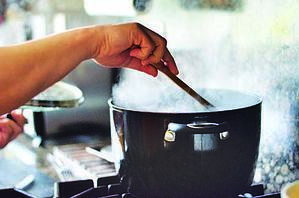 Cooking generates both moisture and aerosols, including solid smoke particles and grease vapor. Uncovered frying can also generate grease spatter particles. Most people know that carbon monoxide (CO) is a colorless, odorless toxic and potentially lethal gas produced by internal combustion engines and burning of wood and other fuels. Even low levels of carbon monoxide can cause ill health effects, ranging from fatigue and headaches to nausea and dizziness—symptoms similar to those caused by common illnesses, such as the flu. Sources of CO include unvented gas or kerosene heaters, gas appliances, wood stoves, chimneys, generators or other gas-powered machines, poorly maintained gas furnaces, cigarettes and car exhaust (from garages or nearby roads). Of course, proper installation and operation of wood stoves, gas appliances and heaters can save your clients from CO exposure, but be sure to stress the importance of following a maintenance schedule. This includes having chimneys cleaned and inspected regularly, as blocked chimneys can backdraft; this also reduces the chance of fire. In addition to these common-sense measures, spec and install CO detectors to further protect your clients. There are numerous ways builders can mitigate an occupant’s exposure to these substances, primarily through installing suitable ventilation systems and proper air filtration, as well as educating homeowners. Ensuring that homes have proper range hood ventilation is a top priority. Wood stoves are a notorious source of particulate pollution, and though much of that pollution blows out the chimney, some of it is either released inside the home and/or pulled back into the home from outside. According to Environment and Human Health, Inc., a non-profit dedicated to protecting human health from environmental harms through research, education and policy, wood smoke “can contain fine particulate matter, carbon monoxide, formaldehyde, sulfur dioxide and various irritant gases such as nitrogen oxides that can scar the lungs.” It also contains chemicals known or suspected to be carcinogens, such as polycyclic aromatic hydrocarbons (PAHs) and dioxin. Wood smoke can impair the development of young lungs, aggravate respiratory illnesses and suppress the immune system. If installing a new wood stove, make sure that the unit is EPA certified. Older units in existing homes should be replaced. Older wood stoves release between 15 and 30 grams of smoke per hour; by contrast, certified stoves cannot emit more than seven grams per hour (non-catalytic models). Some newer models emit as little as one to four g/h. 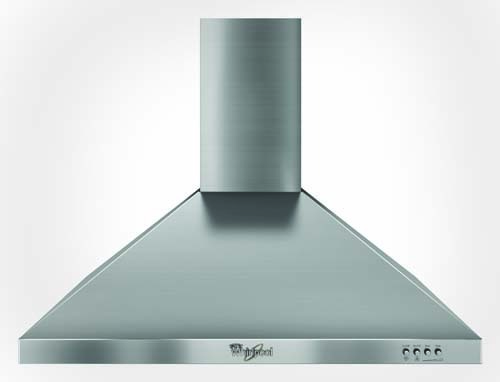 The Whirlpool Gold 30-inch vented range hood includes a 400 CFM fan. This mid-priced range hood has received uniformly good reviews and is available at Big Box stores. There are three main types of ventilation to mitigate pollutants in the home: exhaust-only, supply-only and balanced ventilation systems. And all are not created equal. Worst: Exhaust-Only Systems. These use exhaust fans to remove moisture, contaminants, odors and stale air. Although they cannot effectively mitigate the effects of water leaks on indoor air quality (from mold and mildew), they can remove excess moisture resulting from activities such as showering and particulates from cooking. It is imperative that these systems vent to the outside, and that the ducts are large enough for the rated airflow. It’s recommended to avoid bends or elbows within two feet of the fan, long duct runs and flex ducts. Exhaust-only ventilation systems rely on air leakage in the building envelope or wall vents to supply makeup air to replace the air vented from the home. This is a lower-cost option that is effective in removing contamination at the source, but it has drawbacks. Conditioned air is vented out of the home, and unconditioned makeup air leaks into the home, which is not energy efficient. Makeup air is looking for a path into the home, which can cause air to enter through the flue of a woodstove, furnace, fireplace or gas hot water heater, resulting in emissions coming into the house. In more airtight homes, a negative pressure is created as air is vented out of the home from range hoods, bathroom exhaust fans and clothes dryers. “An issue that has come up in tight homes is: if you have a natural-draft [gas] furnace or water heater, if it is not in a separate closet or in the garage with its own venting to the outside—if you bring one of those appliances into a very tight house, we have concerns,” says Walker. “Is there enough airflow so that the flow goes up the flue? If you turn on the kitchen exhaust fan when you are cooking, you can back-draft the flue. Often very tight homes don’t have natural-draft combustion appliances for this reason.” This issue can arise if a drafty house is weatherized (becoming tighter) and the existing natural-draft combustion appliances remain. “Hybrid” solutions exist that address the problem of makeup air; for instance, Broan-Nutone offers a sensor-controlled makeup air damper that works with most of the company’s most range hoods. It equalizes air pressure when the fan is operating by allowing outside air in through the damper. Better: Supply-Only Systems. These work in the opposite manner as exhaust-only systems. They actively bring fresh air inside, while exhaust air leaves the house through leaks in the envelope. Such systems often take advantage of existing HVAC ducting and use the system’s air handler to bring in fresh air through an inlet at the return. 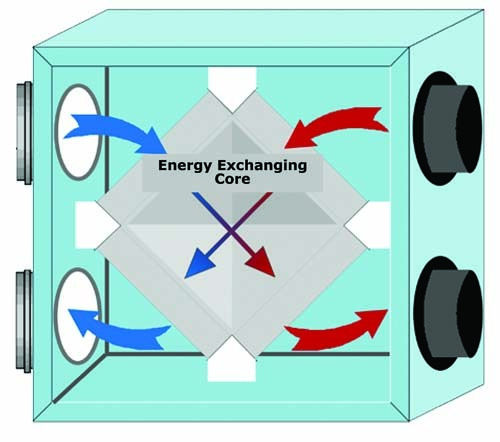 This solution is inexpensive; in addition, the source of supply air can be controlled and filtered. Supply-only systems also create a slight positive pressure inside homes, which can prevent pollutants from being sucked inside. On the down side, fans are still needed to ventilate specific locations such as bathrooms, and in cold climates, the positive pressure can drive moisture into walls and/or create drafts. Best: Balanced Ventilation. There are a variety of balanced ventilation solutions, including heat recovery ventilation (HRV) and energy recovery ventilation (ERV) systems with dedicated exhaust and supply ducts, and ventilation with a central air handler and partial HRV or ERV systems. Such systems typically allow intake air to be filtered, but the cost is often greater than exhaust-only systems and sometimes greater than supply-only systems. They do, however, result in more thorough ventilation when one considers the house as a whole. Ventilation systems with heat recovery capabilities will result in lower energy costs, as much of the heat is captured before the outgoing air exhausts from the home. HRV and ERV systems are a good choice for tighter homes in cold climates, where energy efficiency is a priority. In addition, intake air is filtered, reducing particulates and pollen in the air. The filters need to be changed regularly for them to be effective, however, and thus educating homeowners is an important task. Low-VOC paints generally contain less than 50 g/L; VOC-free paints less than 5 g/L; however, colorants can introduce VOCs into paints. Some manufacturers, such as Benjamin Moore, offer no-VOC colorant systems. An array of chemicals emits volatile organic compounds (VOCs), carbon-based chemicals which evaporate or sublimate (become gaseous) at room temperature. Common VOCs include methane, benzene and methyl chloride. Some are known to cause short- and long-term health effects, while others have no known negative effect on health. VOCs are released from thousands of products, including paints, cleaning supplies, air fresheners, personal care products, building materials, lacquers, adhesives and permanent markers. According to the EPA, indoor concentrations of VOCs can be 10 times greater than outdoors. Because VOCs are a group of chemicals, each is unique in its toxicity. Similarly, the symptoms resulting from exposure to VOCs varies, depending on the chemical, its concentration and the length of exposure. Common short-term symptoms include headaches, dizziness and nausea, vomiting or worsening of asthma symptoms. Long-term effects can include liver damage, kidney damage, neurological damage and a higher risk of certain types of cancers. One example of a specific group of VOCs is toluene diisocyanates (TDIs), which are found in numerous products, including coatings, adhesives and sealants. They are highly toxic. Short-term concentrations of 2,4-TDI can cause severe irritation of the eyes and skin and effects on the gastrointestinal, respiratory and central nervous systems. Long-term exposure can cause considerable reduction in lung capacity and induce asthma-like symptoms. The EPA has proposed action against TDI with a Significant New Use Rule under the Toxic Substances Control Act. Many manufacturers have worked to reduce or eliminate formaldehyde in their products; for example, Owens Corning converted its line of residential batt insulation products to the formaldehyde-free EcoBatt brand. 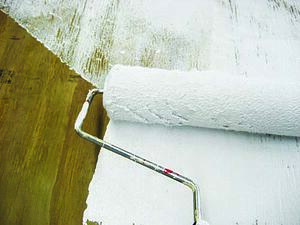 Paint companies such as BEHR and Benjamin Moore offer VOC-free formulas. But while some chemicals that qualify as VOCs have or are being phased out and/or limited, the typical home still contains many VOC-emitting products and materials. Although the EPA has not established threshold levels of indoor VOC emissions, there are third-party programs designed to diminish human indoor exposure to specific VOCs that are suspected or known to impact human health. These organizations make it easier to specify and use low-emission materials to proactively boost indoor air quality. 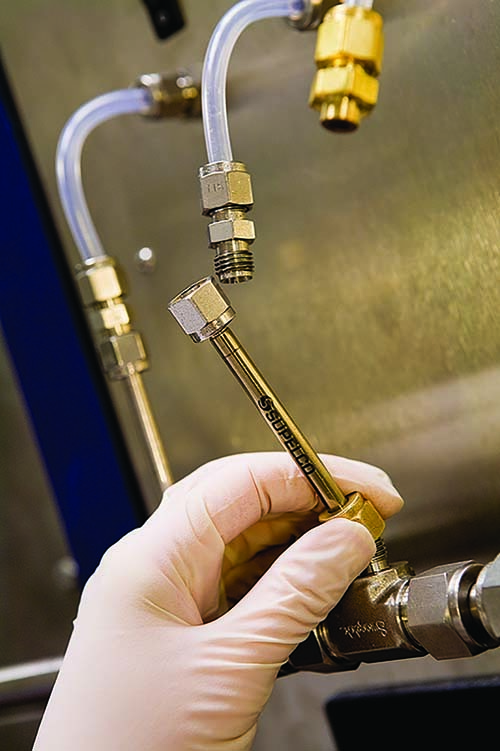 UL Environment collects air samples from the emissions testing chambers using a sorbent tube like this one. GREENGUARD-certified products meet a rigorous standard for healthy indoor environments by screening for over 10,000 chemicals, including formaldehyde and individual VOC levels. This independent third-party program has thousands of certified products in 28 product categories, taking the guesswork out of selecting low-emission products. In addition to boosting indoor air quality, Steady believes that using low-emission products gives a better first impression to the homeowner. If the new home has a strong odor, for example, or the occupants get a headache while visiting, it can tarnish their impression of the house. “You can really build and furnish a home with GREENGUARD-certified products,” says Steady. “The products can be easily found in our Sustainable Product Guide. The listings will also note other environmental attributes of the products, such as recycled and bio-based content and other environmental features.” The Product Guide divides items into several categories and sub-categories. For example, Masonry, Steel and Engineered Wood fall under the Building Construction Materials category. The GREENGUARD certification is at the forefront in innovation and research on semivolatile organic compounds (SVOCs). This group of compounds is widely used in commercial products and impacts indoor air quality. There are also products on the market that claim to capture VOCs and convert them into harmless compounds. For instance, some studies have shown that clay-based interior plasters can reduce ozone and VOC concentrations. Lauzon’s Pure Genius flooring used a patented finish containing titanium dioxide, which reacts with light to break down VOCs. Although builders can dramatically reduce the VOCs in a home, occupants also introduce them into the home with cleaning products, personal care products, craft supplies, construction materials and furniture. An important way to help preserve indoor air quality after the project is complete is to educate homeowners about the importance of using low-emission products in the home moving forward. Excessive moisture or dampness in a home can cause mold growth, which can cause health problems. Molds can trigger allergic reactions, be irritants, and sometimes even produce toxic substances. The best way to prevent mold growth is by fixing water problems, keeping humidity levels within a healthy range and drying water-damaged areas promptly. 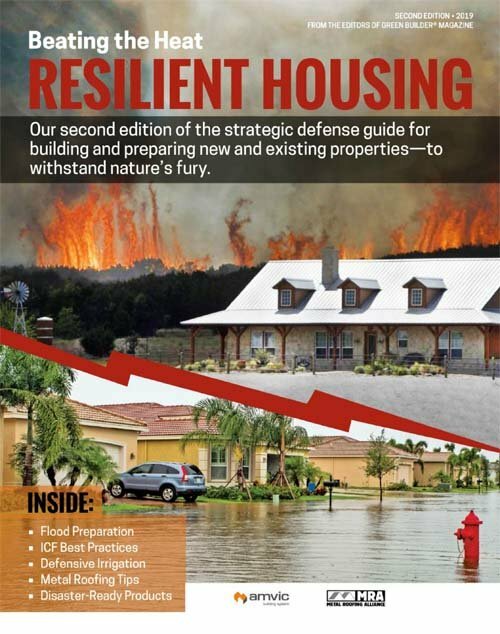 Adequate moisture control is essential for avoiding water damage, mold and mildew issues, and the EPA’s Indoor airPLUS guidelines provide useful information on this. Many of these strategies are also congruent with creating durable homes, starting from the foundation. This includes ensuring adequate site and foundation drainage, installing a capillary break and waterproofing exterior walls that are below grade. In basements or crawlspaces, install drains or sump pumps and insulate or seal the space. Hard-surface flooring is necessary in kitchens, baths, entryways and in utility and laundry rooms. Bathroom exhaust fans are paramount for venting moisture and odors out of the home, allowing pollutants to exit the home from the source. Ensure that each bathroom has an exhaust fan that vents to the outside and that the fan is not excessively loud, as occupants are not likely to use noisy fans with regularity. Ideally, the exhaust fan will operate longer than the homeowner is in the bathroom, so a timer is helpful in realizing this. Similarly, it is important that clothes dryers vent to the outside. Garages can contain numerous threats to indoor air quality, including car exhaust, lawn mowers, paint, pesticides and fertilizers. “The garage is full of all sorts of stuff that you don’t want in the house, from a pollutants standpoint,” explains Walker.